Upgrade with a Membership or AdventureCoins for exclusive gear! Starting right now, buy any AdventureCoin or Membership package of $10 USD or more to unlock the exclusive Crimson CryptLord October upgrade bonus items! 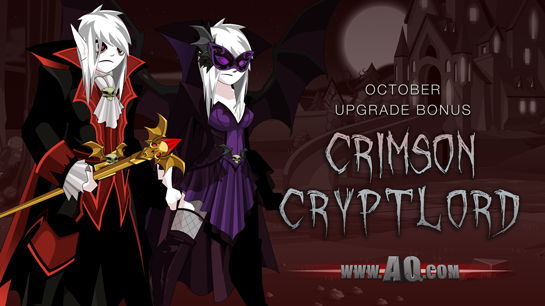 Get the Crimson CryptLord gear and the Dark CryptLord set with a 12 month membership or 12000 AC package. All packages will also come with the CryptLord character page badge, so you can show all your friends who REALLY rules the darkness! The October bonus gear goes rare November 3rd, so get it while it is still here! Unlock exclusive Upholder rewards, the CryptLord armor set, and a full adventure zone when you upgrade your AdventureQuest Worlds account with any membership between September 29th and October 31st! And get the CryptLord October upgrade bonus gear with any AdventureCoin package worth $10 USD or more!